We moved into the Cabbage a good two months ago, yet we still haven’t posted any pictures, despite several requests. When we’d just moved in, it was easy enough to justify holding out. After all, we had boxes everywhere and construction tools still piled in half the corners. Then the holidays were here. Then the holidays were over, and we were swamped with work. After awhile, though, it became easy enough to recognize my hesitation for what it was — shame. On some level, I’ve been dreaming of posting amazing “after” images of our little cabbage. But as far as we’ve come, there’s no denying that, in many ways, our home is still a “before.” When we were still living at our parents’ house, every step forward in this place filled me with elation. We were making progress! Yet now, with each step forward makes me more and more aware of the distance we still need to go. When people come over, I’m no longer excited to show them what we’re working on. Instead, I find myself embarrassed for our OSB floors and the exposed insulation in the ceiling, our lack of windowsills or frames, the bare lightbulbs, and the messed up tile behind the tub. When did pride in our cabbage turn to shame? Don’t get me wrong, I love Pinterest. But all of the time I’ve spent browsing for new ideas for the Cabbage and the surrounding land have made me more keenly aware of the distance between the perfectly styled interiors of my dreams and the very much in-progress home we are living in now, where the couch is too big for our living room, we’re still sleeping on the floor, and we keep a lidded container full of soapy water on hand to catch the stink bugs that appear too frequently. Sometimes I’m embarrassed that I live like this. On the other hand, for the first time since we left Seattle, I feel like I’m living at all. Now that 90% of our time and energy isn’t going into the cabbage, our lives are resuming some semblance of their old rhythm. We’ve been cooking a lot and well, despite our tiny, makeshift kitchen. I’ve started writing again, not every day yet, but nearly. And as our lives have resumed, progress on the cabbage has slowed to a crawl. Don’t get me wrong, we’ve made progress since we moved in — last weekend, Mom and Steve helped us to put up shelves in the kitchen, so we now have a place to store our dishes. Steve got our shower working. Drew rigged up a makeshift “counter” by setting my plastic folding craft table across our tiny refrigerator. 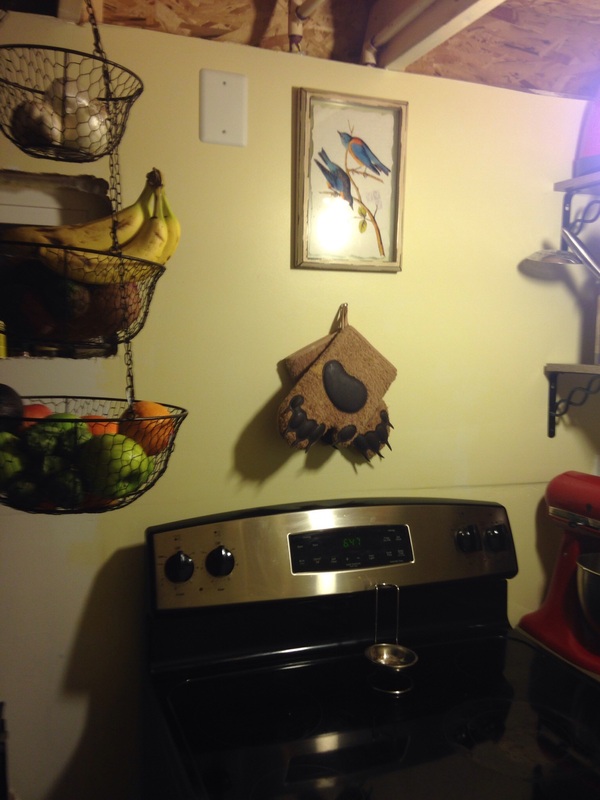 But there’s no denying that we’ve put the home (and this blog) on the back burner. We even have a photo to prove it! 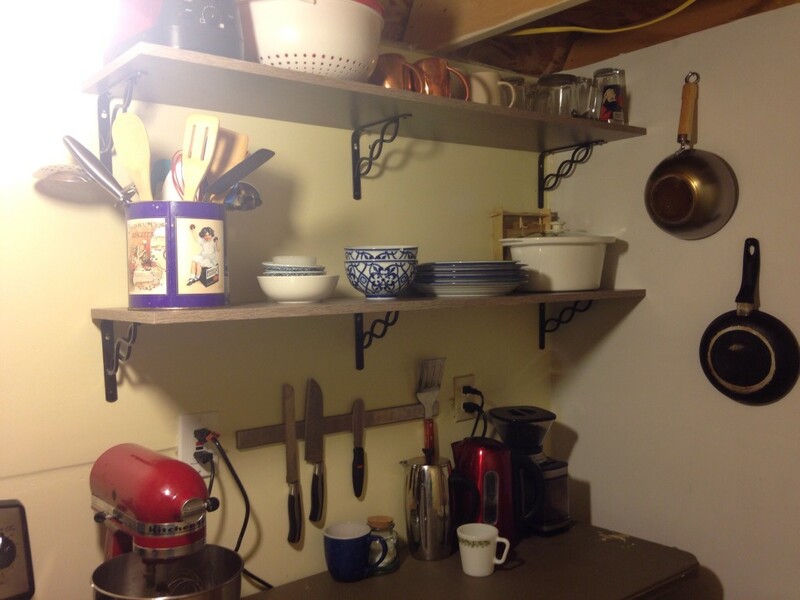 These shelves are cheap, pre-made ones from Home Depot, but they’ve made a world of difference in our kitchen. That splotch on edge of the “counter” is drywall mud that we can’t get off. This table used to hold all of our tools during the construction phase. Sometimes I wonder if Pinterest is to blame for that, too. Or rather, not Pinterest itself, but the idea that life can (and should) be a photo shoot if we just work hard enough. The desire for perfection can be paralyzing. That’s why I’m trying to remind myself that life is a rough draft, and everywhere, revisions need to be made. It’s ridiculous to expect perfection from a house that’s still unfinished. But our homes don’t need to be photo-ready to be loved. I’m grateful for that make-shift counter, for the sink base that Steve built us, for the insulation stretching above our heads. They are signs that we’re doing what we wanted to do, living a life of our own (and our family’s) making. That’s better than a perfectly-styled thumbnail on Pinterest any day. Drew’s bear paw oven mitts are pretty much my favorite thing ever. You can also see the unfinished window on the left behind the fruit. I love your little house, and you should be as proud of yourselves as I am of you both. After the building blitz, it seems to me that putting it all on hold for a bit is a smart move. The day will come when you wake up ready to tackle it, and there’ll be another big wave of progress. Live it, love it! Every time we see a perfect picture, it’s worth remembering that it’s showing only what is visible through the view finder. A step or two either direction could reveal all kinds of flaws. Oh…I think you’ve just described one of the hardest aspect of building your own home. I’ve lived in barebones houses while they were being built around our living. And slept in sleeping bags on the floor. So I get the reality versus pinterest and how disheartening it can feel at times. Pinterest is mostly just an idea factory. Reality is messy and full of funny stories that build a shared history and traditions. For instance, I once sleepily missed a chamber pot and peed through an unfinished loft floor onto my dad’s dresser. I’ve never seen plumbing installed so fast. Take pictures, even if you don’t post them because some day after a slow progression of arranging and replacing and fixing, choosing, installing all the bits you will look around your little cabbage and know it’s better than any highly stylized pinterest shot. Because it’s yours and you’ve filled It with your living and made it a home. It will be perfect. Here is an idea for your exposed insulation ceiling woe: go to a thrift shop and buy a few $2.99 white sheets. Put these up on the support beams, gathering them like in Inara’s shuttle. Or not, You’re crafty and stylish anyway. Maybe you just need to detox from too much of what other people have done to make space for your own creative solutions to come out. Just don’t compare your real life to a single stale but pretty snapshot of some other place. Comparison is the thief of joy.